No matter how many carols played, or how many gifts I wrapped.. I just wasn’t feeling it. The Christmas Spirit left when the chicken pox arrived. (Funny how that happens, huh?) 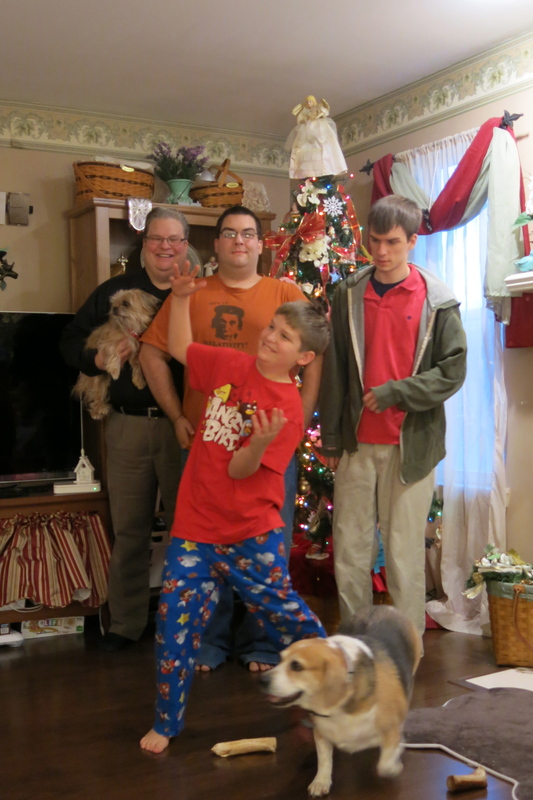 Michael and Matt were maybe 3+5… and they decided to share the gift that keeps on giving… communicable disease. For a solid month we had to stay home as they took turns with fevers and itching….cabin fever doesn’t begin to describe how I felt. It was awful. Yup- right at Christmas. I was disappointed, lonely and depressed. We’d scrimped and saved and planned ahead to have a most wonderful time of the year. Gifts were wrapped… Our stockings were hung from a shelf in the family room… (no fireplace ) The tree blinked in our front room window… but it didn’t matter. Nothing helped. I baked. (and ate.) We played connect the dots with chicken pox. (I have one child who’s still angry about that.. apparently he doesn’t remember it fondly…) We watched videos. (Maybe the Barney videos are what pushed me over the edge…OY. I hate Barney.) I tried hard to make the best of it. But.. each night,when everyone finally went to bed… I felt like crying. Some nights, I did. Having sick kids is stressful and exhausting.. AND THIS JUST WENT ON FOREVER. The places in my heart where I should have felt “Christmas-y” instead felt: wrung out, sad and empty. Instead of finding Christmas joys each day.. I found disappointment- over and over. The holidays aren’t just ONE day… there are a bazillion things to do and places to go… traditions to celebrate and enjoy….or not. Each event missed, left me more and more depressed. The boys were sad. My husband was sad. One particularly sad night, we were watching holiday specials between doses of benadryl and calamine lotion pat downs…when someone suddenly banged on our front door. It wasn’t a bill collector. When my husband opened the door— there was huge group of teenagers on our front lawn. All is calm. all is bright…. It was the youth group from our home church…. caroling. I fought back tears. 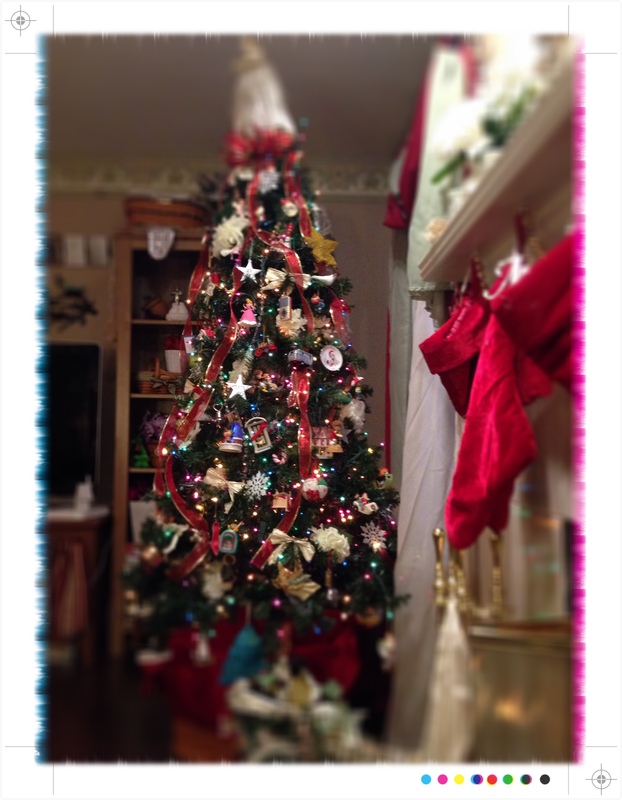 Finally… I felt it: Christmas-y. Someone cared. Someone came. They brought Christmas to us when we least felt it, and most needed it. I liked it. So did they. I’ll never forget those carolers…… and their unexpected gift. Question: What makes you feel “Christmasy? Maybe you’ve stopped by and you’re not feeling it…maybe the kids are sick or bill collectors are banging on the door…I want you to know that I care. And you’re not alone. I’ve been there, felt that, and lived to enjoy the holidays again… and I’m praying for you.. right now. 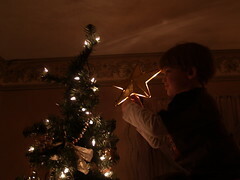 “Dear Lord- the holidays are wonderful and complicated. Sometimes they are disappointing and they are way stressful…I pray that for anyone who reads today thats not feeling it.. that you’d pour out your love to them- and let them know they are not alone..I love you lord– amen. The wind was howling,the snow swirled past the window. There was little cash for Christmas gifts. And I was stressed and disappointed with the holiday in general. Our (half) of a duplex was for sale, and the stress of trying to keep it clean ( & ready to “show”) with two little ones was making me (and everyone around me) crazy and miserable. At my local MOPS group that week- we had made these cool ornaments with just cinnamon and applesauce. It sounded like the solution to both my cranky-ness with my kids.. (we needed to have some fun together) and my minimal budget for Christmas gifts. I bundled everyone one up against the cold and headed out to buy bulk cinnamon and applesauce. We arrived home, cold, tired and hungry. Everyone needed a nap. (Mommy included) This was not to be, I was on a mission. We were going to make ornaments and have fun together, or, (quite possibly) die trying. I turned on the “Johnny Mathis Christmas album” .. put our matching aprons on and showed my 6 and 3 year old sons how to mix the applesauce and cinnamon into dough. It had started so innocently, and smoothly. The boys helped measure and mix like pro’s. Right about the time I started feeling like a scene from a Christmas movie…I noticed rust colored clouds of cinnamon floating through the kitchen and into the living room. They settled into the mauve (don;t judge me- this was the 80’s) carpet to create an insoluble, but holiday scented, mess. Shouts of “Be careful!,” and ” Don’t get cinnamon on the carpet!” soon drowned out poor Johnny. Chunks of cinnamon scented concrete were becoming “one” with the kitchen floor. The pressure of making ornaments “fit to give” spread through me like a virus. I was soon- re-rolling the dough to make it smoother and took all the non-Christmas cookie cutters away so that we wouldn’t be making dinosaurs for Great Grandma’s tree. My oldest totally lost interest, and went to watch PBS. The youngest, continued on. When we were finished and still breathing, I called it a win. Ornaments were drying in the oven, (to speed things up a bit.. I tend to do things a bit last minute;) The house, while dirty and freshly stained, smelled wonderful. That’s when, I noticed strawberry colored patches popping up all over my youngest. His face, arms and hands were puffy and raw looking. Tears welled up in my eyes. I thought: “Great. No money… no gifts… the house is a mess and now the “baby” is sick!” I got scared. I called my husband home from work. I was pretty convinced I had killed the kid. NOT GOOD. A quick trip to the urgent care center revealed a reaction to the cinnamon. A little bath in colloidal oatmeal and frequent slathering with hydrocortisone calmed the rash, but not my heart. That night I cried myself to sleep, the tears and sobs were also prayers, worded and otherwise. I felt like a bad mother. I felt like an idiot and a failure. I couldn’t even just have a fun afternoon with my guys. I was sure I had ruined Christmas. In the morning, I grabbed my coffee, and my Bible, while it was still quiet and the moonlight shown on the snow. I opened it to Luke. I read the Christmas story. I thought about Mary… so young… I wondered if she felt she was ready to be a mother. I wondered if she felt awful for not having things all ready for her child’s birth. They couldn’t even find a room to birth in. 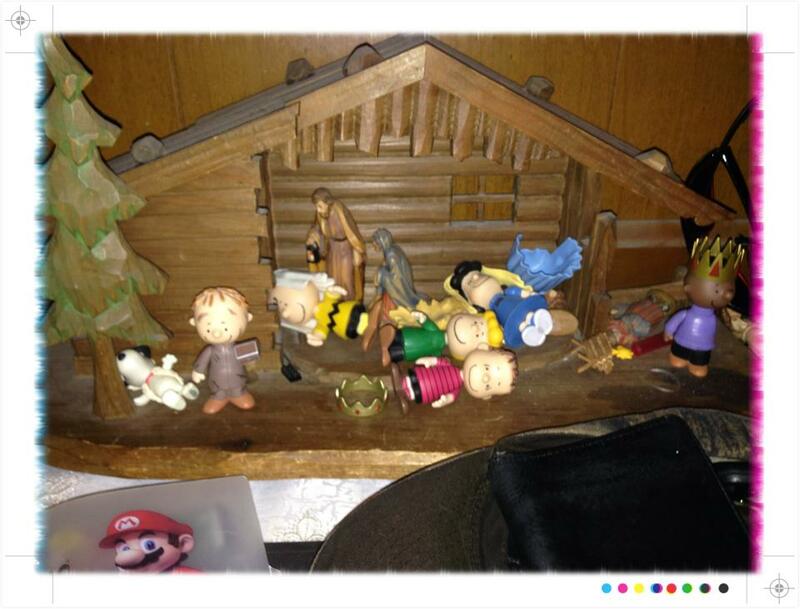 They ended up in a stable. Smelly animals surrounded them, hay poked her in the back, she didn’t even have a “proper” layette. I wondered how she felt. But- there she was- the mother of The Christ Child. I flipped to the Easter story– and re-read that, too…the two stories were one. A light switch flipped on for me. The baby’s birth that I was trying so hard to honor, celebrate and share, perfectly. Had led to the Savior that I needed, yet again, so desperately. Much more desperately than sidewalks and bigwheels. Somehow- everything shuffled back into place. My priorities, lined up again. By the time the boys woke up, I was ready. We continued through the rest of our holiday with joy and rest. No more worrying over the gifts, we could do what we could do. That was all. No more worrying about creating perfect “Christmas memories” with the boys… we decided to just let them happen. 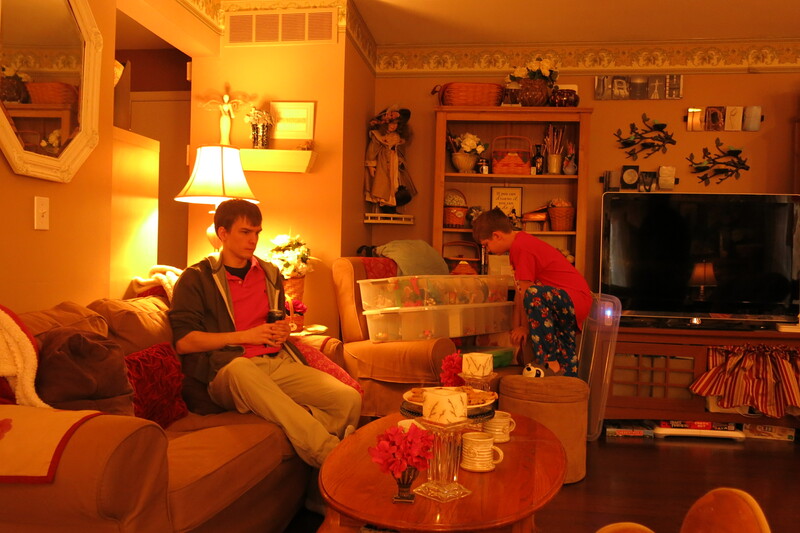 Every year- (my oldest two now 24 and 21,) retell the story of the ornaments, and forced fun. Every year, we laugh. Sure- I still get caught up in the hustle bustle and pressure to create a Martha Stewart Christmas scene….but then- inevitably, I get a whiff of cinnamon. And I remember. The baby in a manger- who grew to be savior…. and get back to the heart of Christmas…. till the next time, I need to be reminded. I should back up…. I didn’t plan it to be a too-cranky-for-cameras experience. 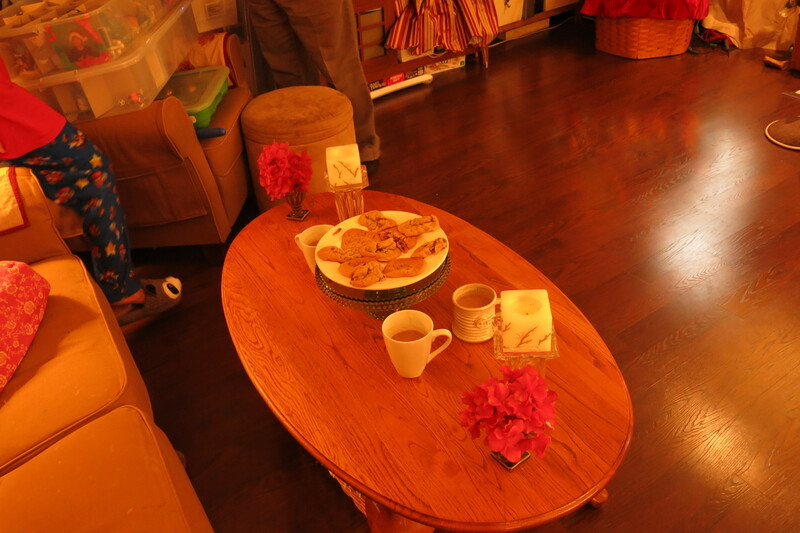 It was supposed to be all: cocoa and cookies and Christmas music and memories made and shared…. A scene that took two days to set up and 12 seconds for me to wreck. I should have known we were at risk when I tripped over the beagle and into the china cabinet while furiously cleaning. I really do mean furiously. 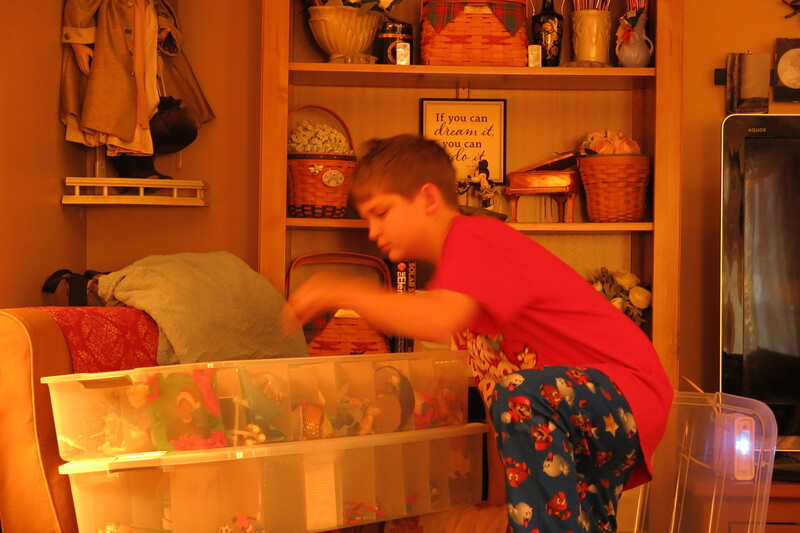 Here is the soundtrack from that cleaning binge….”Why can’t anyone else see what needs to get done, and DO IT? Why am I the only one who can run a vacuum? Why am I the only one who does anything around here???? Why doesn’t anyone put their crap away?” Yup. Furious. I moved furniture, cleared the way for all the Christmas stuff to be brought up and set out- all while having an everlasting gobstopper of a tantrum. The truth is- by the time we finally got to the trimming “party” I was sore, exhausted and frustrated. It was my own fault. Here’s the thing: the fury was partly fueled by my lack of boundaries and teaching my family to be responsible. (With a side of stress and probably a touch of PMS.) The rest was fueled by my desire to make everything perfect. 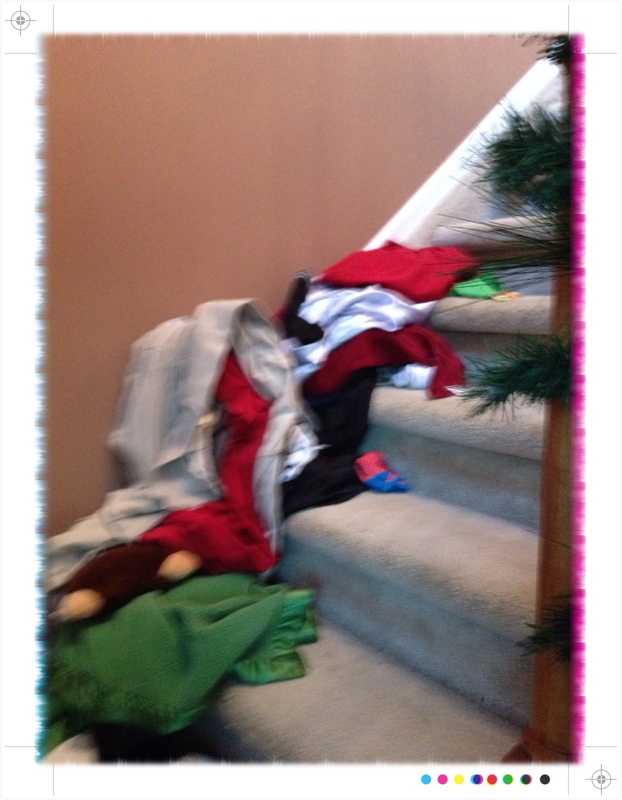 From my messy house to yours: Merry Christmas- and- chill out. Enjoy the moments and stop trying to make the memories perfect… chances are you’re just like me- making everyone miserable. Unless- of course, I’m the only one…. Well, Cancer- here we are again. It’s the holidays- and you are that shadow in the corner. You are the uninvited, obnoxious guest that doesn’t know when to leave. You’re the drunk family member everyone wishes would just pass out already, so we could take the keys from you without blood shed. You are the Grinch trying to steal our Who pudding Who- hash and Roast Beast. For 3 Christmas’ you’ve been an unwelcome guest. We’ve done and are doing everything to try to get you to leave- from serving up obnoxious juice concoctions and organic everything…to surgery, radiation and now: starving you of the hormones you crave. I wish I could say that we’ve dodged everything you’ve thrown. I wish I could say that while you’ve shown up over and over each year to steal our cheer- we haven’t let you. I wish I could say that our heavenly heart alarm (kind of like a home alarm system, only it can tell the difference between a cat and a burglar. And it protects your heart- not your house….and Jesus shows up instead of the police….pretty much.) has caught and detained you every year. It hasn’t. Maybe we forgot to pay the bill. The truth is- your repeated attacks and effects, make our hearts ache. Maybe even more so at this time of the year. Because-it shouldn’t be this way. Cancer treatments and side effects should not be part of our holiday decor. Fear, anxiety, facing mortality, and an unknown future aren’t on anyone’s Pinterboards for holidays. Cancer is never highlighted in a magazine spread on how to host the perfect holiday. Cancer has never been one of Oprah’s Favorite Things or Ellen’s 12 days of Giveaways. (Could you imagine the audience response on that one? ) Norman Rockwell never painted a Merry Cancerous Christmas. Christmas is supposed to be all Silverbell’s and Holly Jolly. Not, hot flashes and PSA tests and Cancer center appointments. Honestly… Christmas has always been different form what we imagine and try to create. There have been holidays on bed rest- threatening to miscarry, holidays with chicken pox (FYI: Santa is immune.) holidays with stomach flu,holidays with grief and loss, holidays’ with casts, holidays after surgery, holidays with surgery looming with in days, holidays with family conflict, holidays with no money, holidays with overspending and a nightmare of bills in January. All things we didn’t invite. All things we didn’t want. All messy and broken and imperfect. Yet somehow, all still wonderful. Yup- Christmas has always been broken. Maybe it’s brokenness is supposed to be. Maybe we need to to be broken to remind us of our greatest need….. for a savior. Which- by the way Cancer- you cannot conquer. You cannot steal, you cannot ruin. The savior has already come. On that first messy broken Christmas. In that dirty manger. He was born while gawkers gawked, rumors swirled and threats threatened- he brought peace. So you know what Cancer? Merry #BrokenChristmas. There has always been beauty in broken Christmas’ past- and there will be in this one too. “Therefore the Lord Himself will give you a sign: Behold, a virgin will be with child and bear a son, and she will call His name Immanuel” (Isaiah 7:14). Immanuel means God who is living with us. Isaiah also gave this prophecy; “For a child will be born to us, a son will be given to us; And the government will rest on His shoulders; And His name will be called Wonderful Counselor, Mighty God, Eternal Father, Prince of Peace. There will be no end to the increase of His government or of peace, On the throne of David and over his kingdom, To establish it and to uphold it with justice and righteousness From then on and forevermore. The zeal of the LORD of hosts will accomplish this” (Isaiah 9:6-7). The prophet Micah foretold where He would be born. “But as for you, Bethlehem… From you One will go forth for Me to be ruler in Israel. His goings forth are from long ago, From the days of eternity” (Micah 5:25). Isaiah prophesied that even though He would be “pierced through for our transgressions” and “crushed for our iniquities” (Isaiah 53:4-6), He would also be raised from the dead. “But the LORD was pleased To crush Him, putting Him to grief; If He would render Himself as a guilt offering, He will see His offspring, He will prolong His days, And the good pleasure of the LORD will prosper in His hand” (Isaiah 53:10 cf. Psalm 22:19-24). Dear Reader- I don’t know what shadow is lurking in your Christmas…. sickness, pain, loss, grief, fear un met expectations or just plain brokenness. But I want you to know this- you are not alone. Broken or not- it’s still Christmas- because of that first messy- not what anyone expected Christmas- when the savior we so desperately need- was born. Invite him into your brokenness. Invite him into your mess- he can handle it. He’s been there. If you’re struggling with brokenness this Christmas- I recommend you read “The Beauty of Broken” by Elisa Morgan- it will remind you that there IS beauty in the brokenness- and that we’e all broken. There is no perfect family- not one.